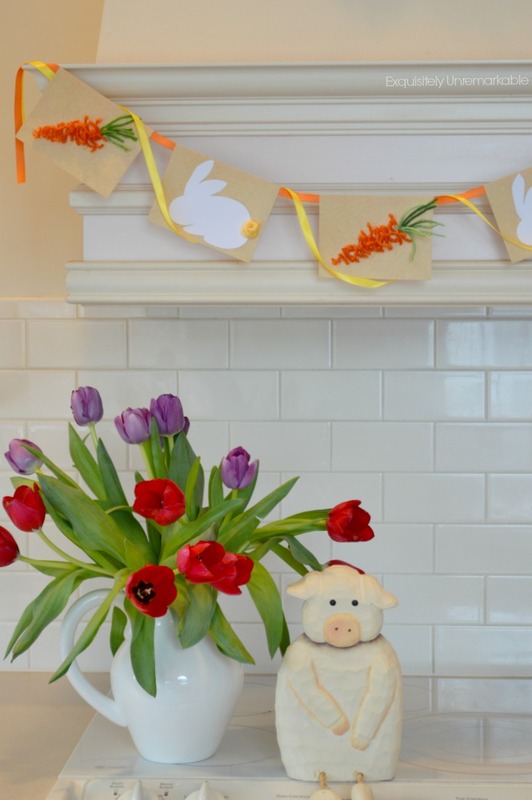 Decorate your home for spring with the super easy Easter Garland. 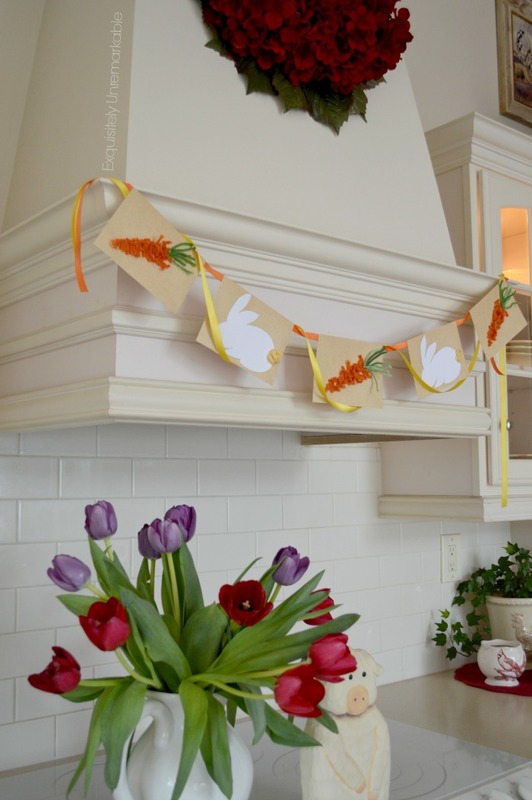 Holiday banners are an fun way to add a festive touch! It's official. I have become a banner junkie. It all started last February when I whipped up a Valentine Love Garland from leftover puzzle pieces. It was so pretty and looked so great in my kitchen that when I took it down, it felt like something was missing. When this Valentine's Day came along, I was so excited to have a reason to adorn my hood again that I got very busy, very quickly. Since I wasn't looking for anything complicated or expensive, my Valentine Note Card Banner was the perfect fit. Well last week, I finally took it down and once again, my kitchen looked a little empty, especially since the view outside my window still screams winter instead of spring. I decided to make another banner to add a pop of festive color! I didn't want to spend any money or go shopping, so I looked in my craft bin to see what was lurking inside. Lucky me, I had a bunch of stuff to make a quick banner. I started with the envelopes that were leftover from the Valentine Note Card Banner ~ nothing goes to waste around here. They are a great tan color, very burlap in tone. Next, I grabbed some orange and green yarn from my stash and my glue gun. My glue gun is seriously my crafting best friend. I started by mocking up a yarn carrot. I snipped yarn in various sizes to create a triangle shape. 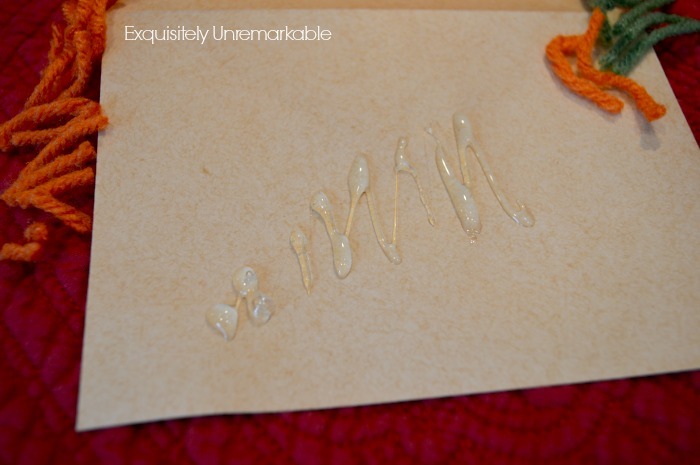 When I was satisfied with my art, I grabbed the glue gun and made a carrot shape on my paper. 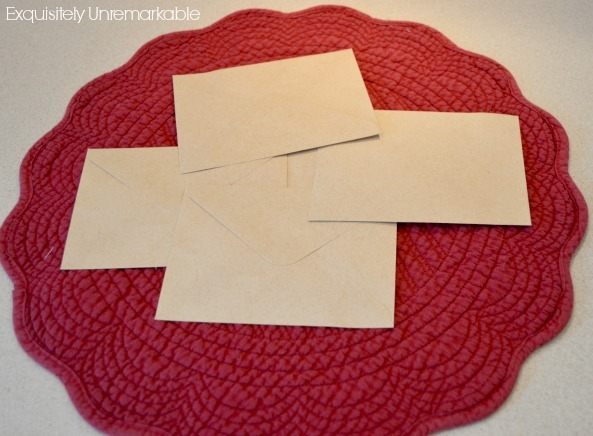 Just make sure that when you start working with your envelope it is positioned so the flap opens on top, otherwise it will be hard to string up later. Hot glue dries very quickly on paper, so I had to be pretty speedy when I dropped my pre-cut pieces of yarn in place. Once completed, I realized that I wanted it to look a bit more three dimensional, so I added a few random stands on top in odd directions to give the carrot a more rounded appearance. When that was complete and I was satisfied, I added a few green strands to the top. I made three carrots to use in my banner. Time to move on to the bunny! 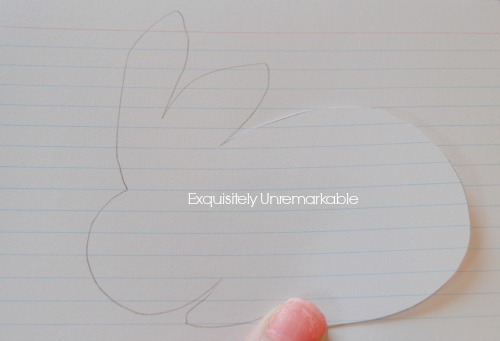 I picked up the scissors and cut a bunny shape out of a 5 x 7 index card. I liked what I came up with, so I traced it on another card, as I needed two. It is a very basic shape. I included a photo of my cutout below, in case you would like to use it. Just enlarge it or shrink it to fit your envelope. I glued the bunnies to the envelopes and added a small yarn tail with hot glue ~ best friends, remember? 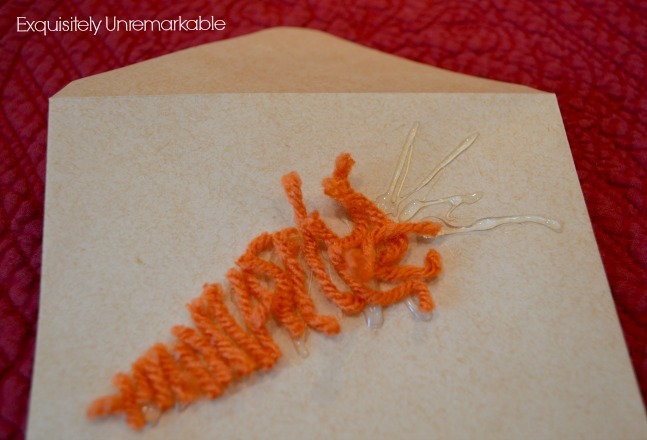 Lastly, I glued each envelope shut around a long strand of orange ribbon. I added the yellow ribbon as an accent. I needed a bit more color to really make it pop. I didn't affix the yellow ribbon to anything. It is just lightly draped over the cards. That's it! The banner honestly took me about 20 minutes from conception to completion and now my kitchen is freshly adorned...again! I absolutely love it. 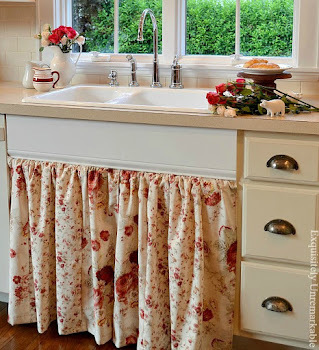 It was super easy to do, completely free as I shopped my own craft bin and super easy to construct! Can believe it's not red? I make banners from all kinds of stuff. Take a peek! so so cute! great job, as always! Thanks so much, Audra. You’re always so kind! Thanks Su! It's simple, but I like this one, too! Awww, so cute and easy! Looks lovely, Kim! 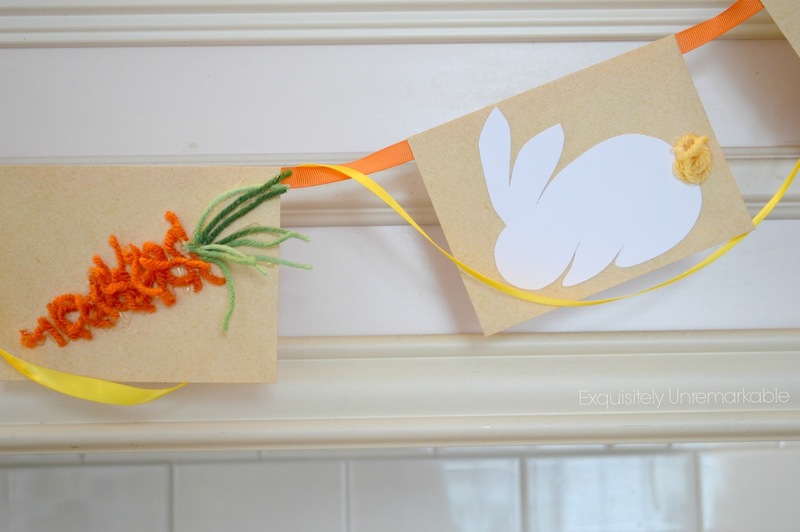 Wow what a cute banner and so adorable with the bunnies and carrots! Thanks for sharing how to make one! That is just too cute. And great that you were able to shop your craft stash. I have gotten so lazy about decorating for the holidays. Some or all of my bunch will be home for the Easter weekend. You have inspired me to do some decorating. Well, you were a whiz to make it so fast and it is just adorable! Gotta love that glue gun, Helen! Thanks for the sweet comment! This is really cute. You are amazing with these banners. This one is really sweet love the carrots. Have a wonderful week end. Ah ... it's adorable. It'll help you stay happy until this awful "W" is gone. I loved the 'yarn' carrots. Very creative! It's adorable! I think a lot of us will be copying! You are so clever, Kim. You always make everything look so easy yet beautiful. Cute! and fun. I can see using different banners throughout the year. Thanks Mary. It is an easy way to decorate for sure. What an adorable banner! Pinning! Oh my how cute! 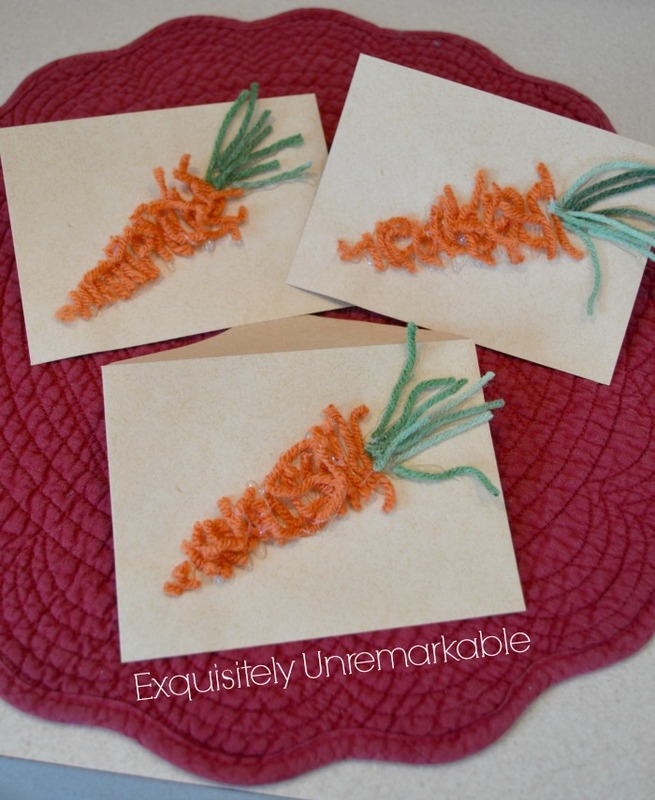 Love the way you created the carrots! Thanks Pam. I like this one, too...very easy to do! I love this! What a great idea for the carrots. Thank you, Cari. I like the look of them, too. Cutest banner ever! LOVE the carrots! Brilliant! Thank you, Jenna! 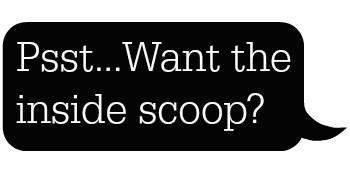 They are so easy to whip up...just snip and glue. Toooooooo cute!!!! I love the little bunnies, and the carrots are genius! Have a blessed week and Happy Easter! Love, love your banner! How pretty! Happy Easter! Thanks so much, Maria Elena! It was super simple to do! I'm a big glue gun mess, trust me, Rue...burned fingers and spider webs everywhere. We have a very dysfunctional relationship, but it gets the job done. Kim, you are the garland queen, really, no matter the season or holiday or occasion, you always come up with the most adorable ideas, which are quick and easy, too! 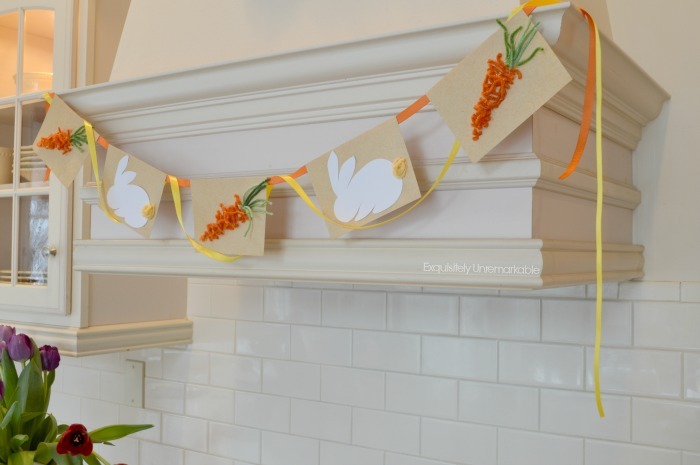 Your cutie pie bunny and carrot garland banner is beautiful! Banners are so easy for me, Poppy. I don't know why, but they are easy for me to create, so I am sold!! So cute! Those carrots are just too darling! Really adds a lot to your hood. Thanks for sharing it with SYC. Thanks Jann! I'm going to have a hard time taking that one down! How adorable!! I know Easter is over but I may have to try those carrots (not real ones, the ones you made). :-) I love those!! Thank you, Benita! Those carrots were so easy to make, you could whip them up in a jiffy! This is just too stinking' cute! Thanks for the how-to's! There you go again making something adorable out of practically nothing! I love how your brain works! So ADORABLE, and so clever! Thanks Deb...so easy to make! I knew the minute I saw "banner" in the title that it had to be yours, Kim.....you are the "Banner Queen" as opposed to the "Dancing Queen," or maybe you're that, too! Sorry, I just feel goofy -- too much radiation, maybe! Anyway, I truly adore that Easter Banner and that is the perfect spot to display one! I'm a banner junkie too! Love your carrots. You post was truly a joy to read and I hope that you will continue adding your ray of sunshine every week on Thoughts of Home on Thursdays. Thanks Laura! It was fun to make!